Zaremba’s work examines the human condition, as well as the intricacies and idiosyncrasies of relationships, communication, and the mind. Through the inventive use of humor, a minimalist aesthetic, and and graphic illustrative style, his work provides a poignant commentary on contemporary life. 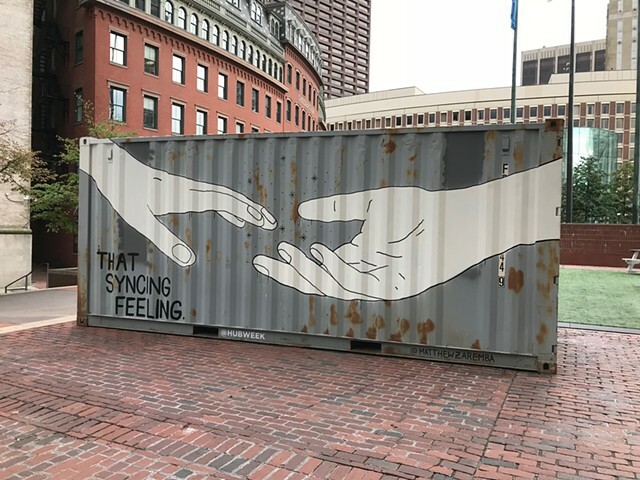 In the form of an introspective metaphor, That Syncing Feeling serves as a reminder of the power of the human connection in an increasingly digital world. Zaremba: “We live in a time where we all increasingly get our sense of validation from social media followings and press hits, so I’m always balancing that awareness with the fact that I could care less. When you’re making art based on your reality, there’s really no plan b. I’m going to continue creating pieces whether thousands of people see them or only a handful.” Matthew Zaremba is a published visual artist whose work has been exhibited across the United States and abroad.